This is the Powermax Fitness cross trainer buying guide. We have put it together to help you to translate cross trainer sellers advertising. We hope it will help you to identify the important features and compare cross trainer features. What are the benefits of Elliptical machines? 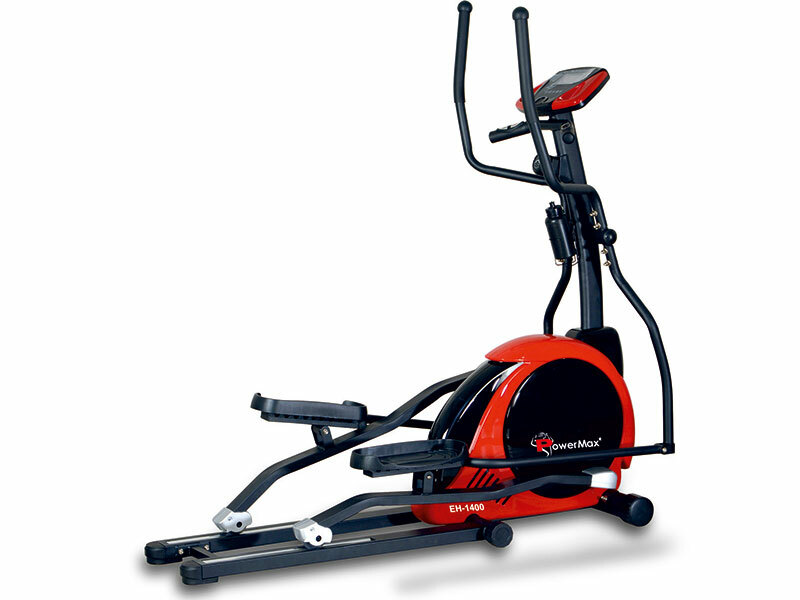 Elliptical Cross-Trainers provide a low-impact cardio based workout. They get you fit by working for particular muscle groups, increasing your heart rate and breathing, thereby improving your overall fitness over time. They provide a low-impact workout as there is no jarring on your bone joints due to the machine carrying your weight at all times. As you stand on the foot-plates, the machine provides a controlled path of motion for both your legs and arms. Your arms move in a controlled back-forward motion and your legs work in an elliptical-circular motion. The idea behind an elliptical trainer is that the foot follows the movement of walking or running, but without the floor underneath the foot to halt that natural flow. This eliminates the impact caused by the ground and allows the best part of the exercise to continue. With age come aches and pains. For the regular exerciser who has been training for many years and to be injury free would be unusual. Therefore anything that reduces the stress on joints and muscles, as you get fit, is going to be popular. The elliptical action follows the natural path of motion of the ankle, knee, and hip considerably reducing the pressure on this part of the body. The movement is smooth and continuous and there is never any pounding or tugging related to the exercise. Yet it is still load bearing, unlike an exercise bike and load bearing exercises are important to anyone with the onset of osteoporosis. Working the whole body is a great way of burning calories and shaping your physique, yet the perceived exertion on an elliptical is less than on other equipment. So you are actually working harder- but without feeling it. Finally, you will find quality elliptical trainers will require less maintenance than many other types of fitness equipment. With a non-impact exercise, it’s not only your joints that get less hammering but the machine as well. Walking has long been known as one of the best low impact exercises you can perform reducing the problems of muscular and skeletal injuries now and in the future, but there is a limit to the level of intensity that can be achieved. For younger exercisers and fitter older individuals this is a real problem and is just not intense enough. Also, people are living longer and older people are excising than ever before. But inevitably age brings problems to muscle and joints but that still does not mean that their heart and lungs are not capable of a good workout. Elliptical trainers can fill this void as they can provide a wide range of workout intensities but still minimizing injuries to muscle and joints of the lower extremities. 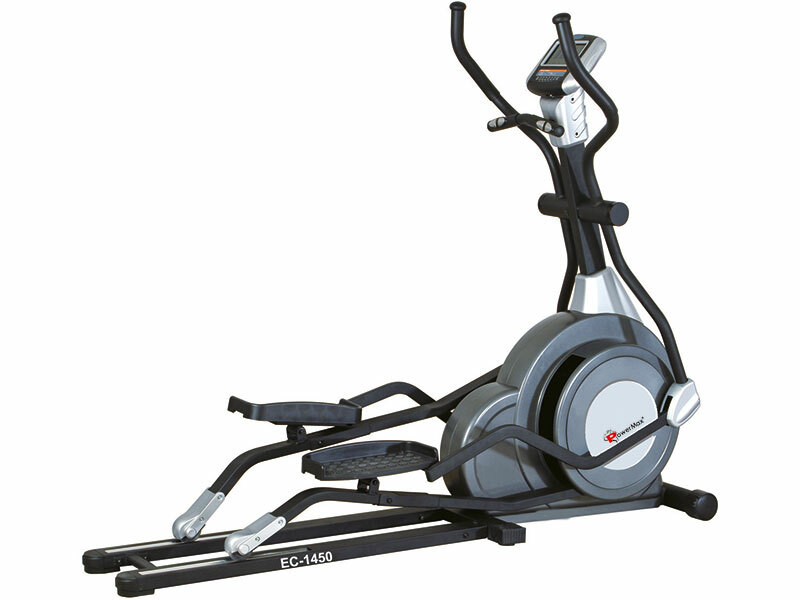 What kind of elliptical cross-trainers are there? Rear driven cross trainers have flywheel at the back of the machine and have a slightly more elliptical motion than front driven cross trainers. 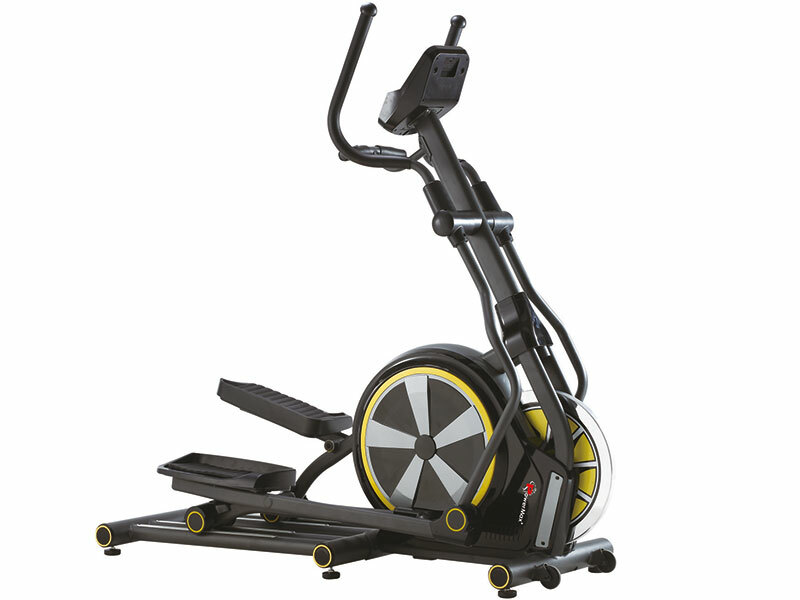 The front driven cross trainer has a flywheel at the front of the machine and has a slightly flatter movement. In general, selection of a front or rear driven cross trainer is down to personal taste and won’t make a massive impact on the quality of your workout. Incline Cross Trainers: Allows the user to target different muscle groups when the level of incline is changed to simulate walking up the hill or on the flat. Particularly good for targeting core muscles, bum, tum, and upper thighs. Generally, provide a range of stride lengths to choose from in one machine. Allows the user to choose between a walking motion (with a shorter stride length) and a running motion (with a longer stride length) for a more intensive workout. These are also a great option for home use where different family members with different natural stride lengths are likely to use the cross trainer. This type of machine uses a varying magnetic field to control the resistance level. An electric current is passed through the electromagnets to create a braking force. This is the type of resistance most good quality cross trainers offer.The biggest benefit of an electromagnetic cross trainer is that you can increase the resistance quickly by pressing a button on the console. If you have to manually adjust the resistance belt with a tension dial, the resistance will only change as quickly as you can turn the resistance dial. This is also very frustrating when you are in the middle of a workout. 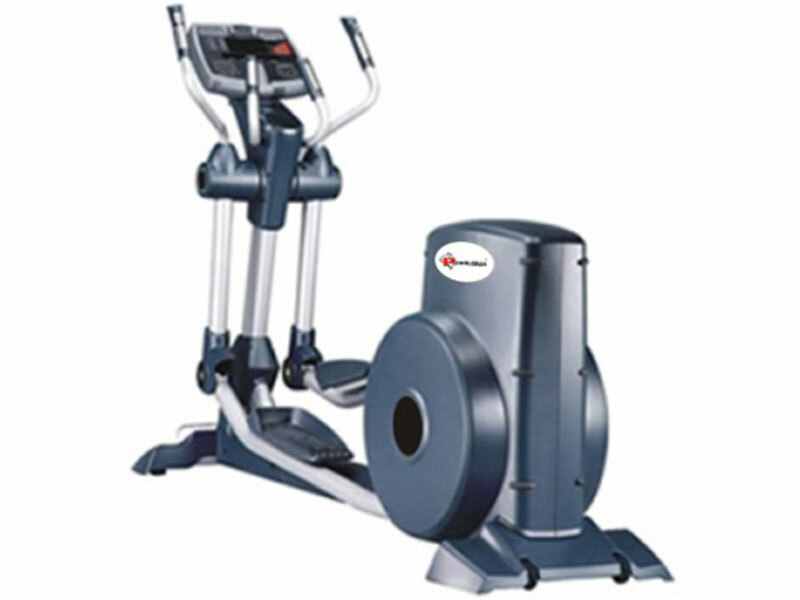 Cross trainers with electromagnetic resistance are quieter and more durable than fan or belt cross trainers. Measures resistance in watts -meaning that they can be much more accurate. This is a nice feature for athletes but pinpoint accuracy isn’t a huge problem for most people who are exercising on a magnetic resistance cross trainer and they are generally much more expensive. Cheaper cross trainers often use a belt and flywheel mechanism to manage friction. We believe these types of cross trainers will leave anyone looking to achieve an intermediate level of fitness feeling unchallenged. They are less durable than other cross trainers because the belt wares out over time. They are also much noisier than electromagnetic cross trainers. We advise you to find a cross trainer with electromagnetic resistance instead. Biomechanics: As mentioned, this is determined by the type of drive system used in the elliptical. You want good biomechanics with the handles and foot-plates to be comfortable when in use. They must be easy to reach and you should be able to step on-off easily. When on the machine, the distance between your feet must be narrow (no spreading of your legs). Stride Length: This is the distance your foot will move horizontally with the plate on the cross trainer. The taller you are, then the longer your stride (walking distance per step). Stride length should be around 46cm to 60cm (18 inches to 24 inches). Choose a machine with adjustable stride-length and adjustable foot-plates to get the best workout. Cross trainers offer a variety of stride lengths and it’s important to select the right one for you. User Weight Capacity: The stronger the frame, the higher the weight capacity of the machine. This is a good indication of the quality of the machine. However, there is a lot of false advertising online from non-fitness specific websites in regards to the user weight capacities of their machines. For example, they claim to have machines with a capacity of 200kg, when really they more likely have a capacity of 100kg. Computer Console: You want the computer console to clearly display all measurements of your workout and have built-in programs. The latest technology allows downloading of programs from online and integration with Google Maps and Facebook for competing with other users. Flywheel Weight: The heaviest part of a cross trainer. It is used to create a smooth and stable workout. The size of the flywheel is one way to identify a good quality cross trainer. We would recommend buying a cross trainer with a flywheel of 10kg or bigger. NB Try to take into consideration the total weight of the machine too. Manufacturers vary with what they include in the flywheel size and the more unscrupulous can include parts of the frame in this weight. If you are comparing two cross trainers and one is much lighter than another but it seems to have a huge flywheel we suggest you think twice. Resistance Level: This is a tricky one! In general, having a larger number of resistance levels on a machine is better than only a few. The higher number of resistance levels will allow you greater control of resistance because there are lots of levels to choose from. 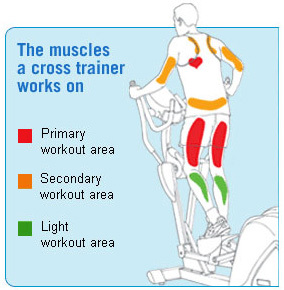 However, cross trainer 'A' with 20 resistance levels might not offer more resistance than cross trainer 'B' with 10 levels (each level on cross trainer 'B' may just be spread further apart). So, in general, we would recommend that you don't use the number of resistance levels on a machine to help you make your buying. Warranty: You want a warranty that can support the use the elliptical cross-trainer will be getting. 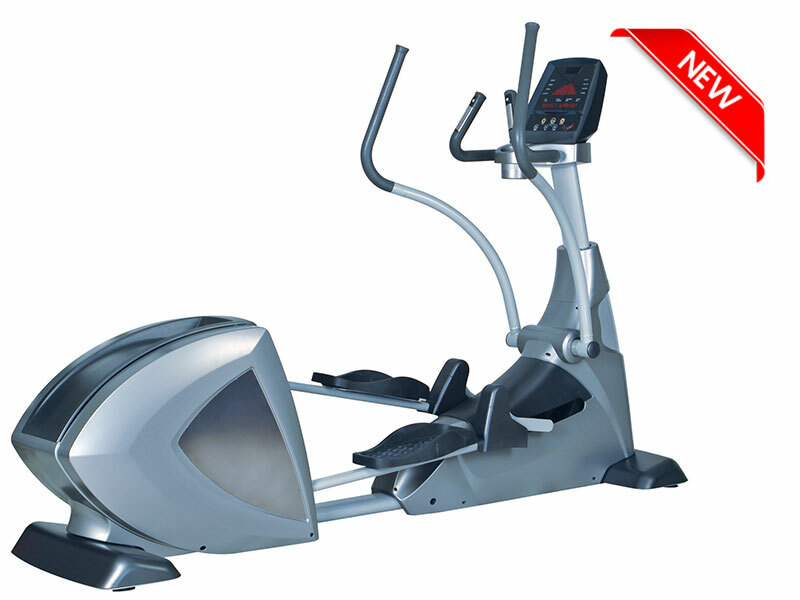 At Fitness Market, we support our Ellipticals with extensive warranties. Getting a cross trainer with the right stride length will make a big difference to the effectiveness of your workout. If the stride length isn’t long enough you may find that the fluid, low impact, movement that cross trainers are known for is badly affected. Stride lengths that are too short can create an unnatural, jarring, stance and prevent you from working out at your maximum intensity. In general, cheap cross trainers have a shorter stride length (up to 16 inches). 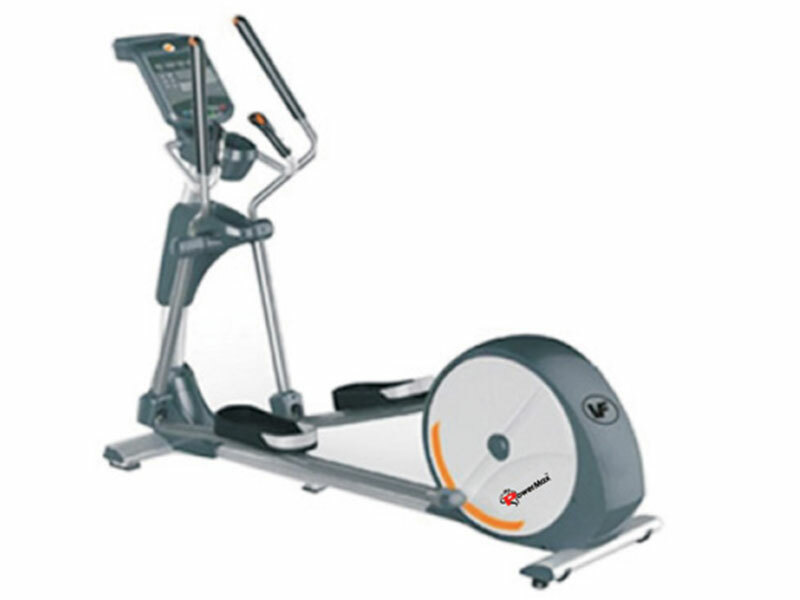 Gym quality cross trainers generally have a stride length of 20 inches. Machines with larger stride lengths provide a better workout for a broader range of people. If more than one person will be using the cross trainer or you would like to vary the intensity of your workout we suggest a cross trainer with an adjustable stride length will be a match made in heaven! 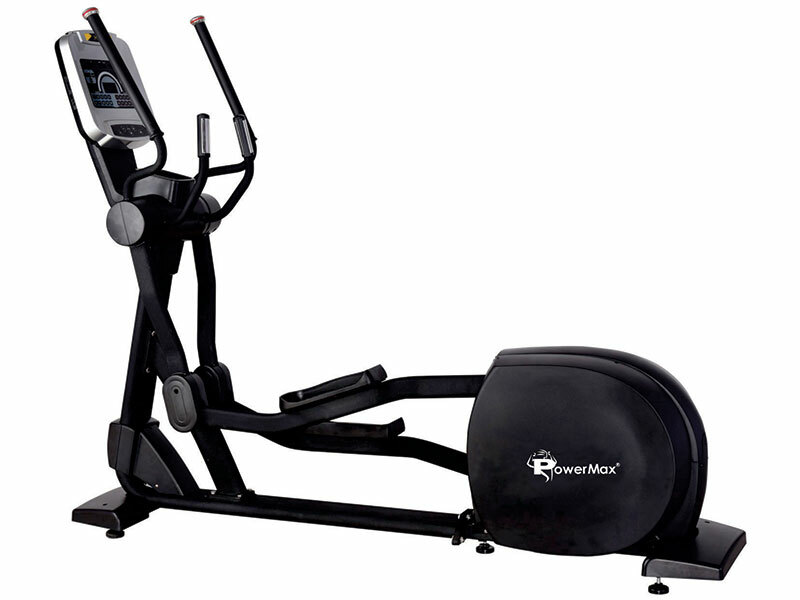 Try the Powermax Fitness EC-1550 for size! NB. If you go for a cross trainer with a larger stride length than recommended your cross trainer will keep up with your improving fitness levels. So if your budget allows it always try to buy a larger cross trainer stride length than you actually need. 1. I'm 6ft tall. Do I need a longer cross trainer stride length? At 6 ft tall you are slightly above the national average. We would recommend going for a cross trainer of between 18 and 22 inches depending on the level of fitness you want to achieve. 2. I'm quite short. Do I need a shorter cross trainer stride length? No, the stride length just needs to be long enough to stretch your legs out between a walk and a sprint. The longer the stride length the more natural you will feel on a cross trainer. 3. What is the best stride length to buy for multiple users or a family? For a family it's best to have a cross trainer with an adjustable stride length, this means each family member can change the length of their work out. 4. What are the drawbacks of a longer stride length? In general, a long stride length is best. But it can have an impact on the size of the machine and the cost. If you want to buy a cross trainer with a long stride length but you are worried about space take a look at the unique Powermax Fitness EC-1500. It has a patented design that keeps the size of the machine small but offers the stride length of a cross trainer found in commercial gyms. 5. 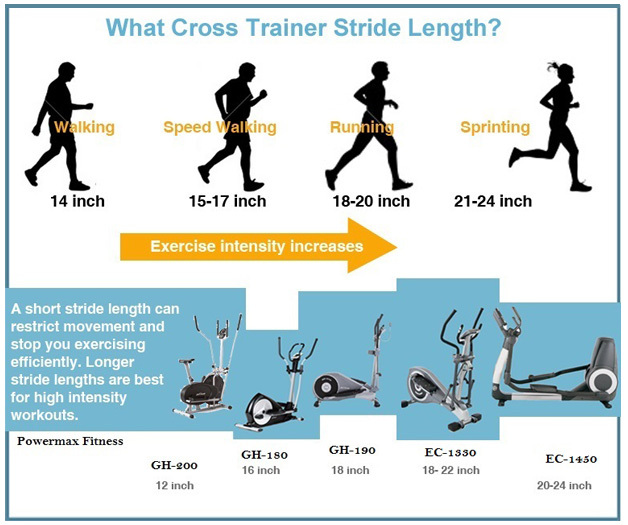 What are the drawbacks of a shorter cross trainer stride length? If the stride length is too short for your height you may not be able to do a sprint on the machine. You may also experience squeaks and creaks coming from the joints of the machine as they are constantly being overworked. Machines with shorter stride lengths usually have smaller flywheels which also lowers the durability. Installation service and warranties that cover constant use in a gym environment. Cardio heart rate features and great programmes. A 10-16inch stride length - a shorter stride will restrict your movement. See our stride length guide here. 114 to 140 cm total machine length (this increases with the size of the stride length). 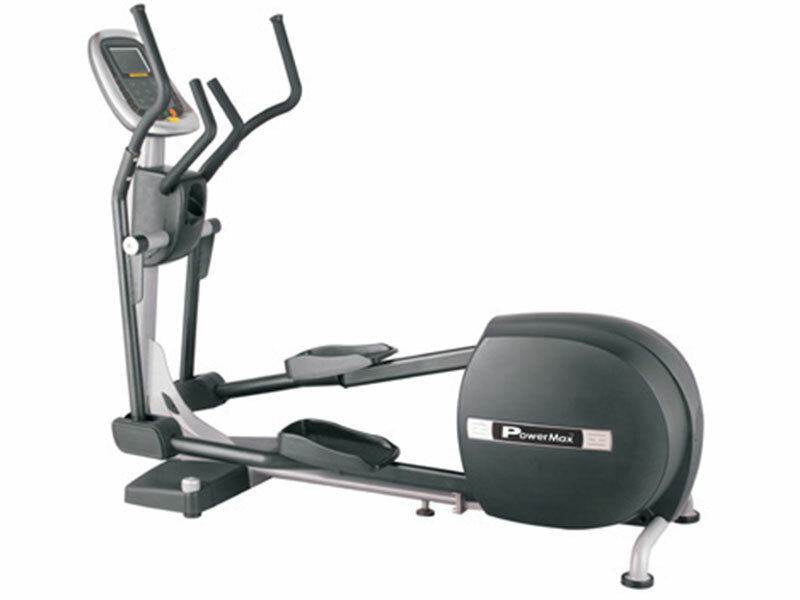 An example of a great home use cross trainer with a 16-inch stride length is the Powermax Fitness GH375 Magnetic Cross Trainer. Semi Commercial Variable Stride Length Cross Trainers: These variable stride cross trainers bridge the gap between the smaller home use cross trainer and the superior workout on gym cross trainers. There are a variety of names for this type of machine including adjustable/extendible stride length or ‘extended motion technology’. Through clever, patented designs, they combine a longer stride length with a compact cross trainer. They allow a machine which is a suitable size for the home (140- 150cm) to accommodate stride lengths of up to 22 inches. These longer stride lengths (of 18 to 22 inches) allow a higher intensity running motion, just like cross trainers at the gym. 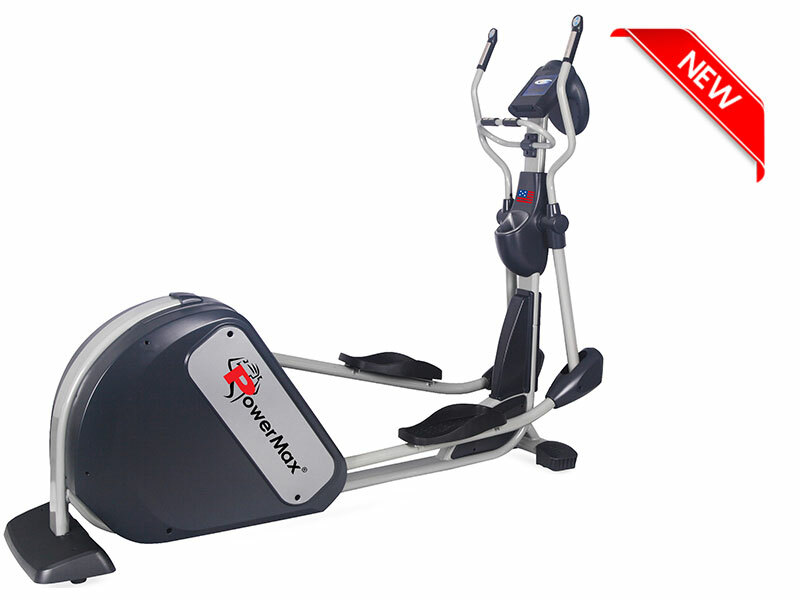 Check out the Powermax Fitness EC-1520 Cross Trainers. 2-in-1 Cross Trainer Bikes: These are a great option if you are new to fitness. They offer a low impact workout, they are cheap and compact. You can either sit or stand which is great if you are new to regular exercise whilst the handles provide an upper body workout and stability. If you want to get your heart rate up regularly for general health these cross trainer bikes are a good option. They have a very short stride length so expect to feel like you are doing a brisk walk rather than getting an intensive workout on a gym cross trainer. See our stride length guide here.